While they might not be the sci-fi renditions that have been popular for years, real lasers can be used for good in the dental industry. A trained and qualified dentist will be able to perform laser surgery with minimal risks, and it can be used to treat all kinds of conditions. Furthermore, your oral health professional will enjoy a greater level of precision with a laser than with a drill. Read on if you’d like to see what laser dentistry can do for you. As long as you trust your dentist, every procedure that you and your professional decide is right for you should be safe. 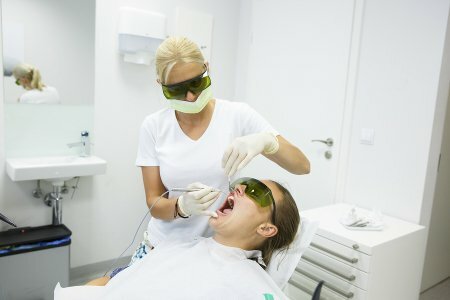 Although some people might not know what to expect when they think about undergoing laser dentistry , this type of procedure can actually be quite safe. Do your research before you go in and see your dentist to make sure that he or she has extensive training and experience with laser dentistry so that you know you are in good hands. Laser dentistry has become much more popular over the past few years, and it can now be used to address an array of oral health problems. Your dentist can help you fight against the symptoms and progression of gum disease as well as remove oral growths thanks to this new dentistry development. Many people tend to be more comfortable with lasers than other alternatives, so see if laser dentistry might be a viable part of your next dental restoration. Sometimes it’s what laser dentistry can do for your dentist that can make you more comfortable with your upcoming procedure. Lasers allow for an extra level of precision, which can make for a more comfortable atmosphere and successful treatment for both the dentist and the patient. For more on what laser dentistry can do for you, talk to your dentist serving Hazlet. Glenwood Premier Dental offers cosmetic, implant, and emergency dentistry. Check out our website or call us at (732) 264-4477 to learn about our teeth cleaning, oral cancer screenings, and teeth whitening treatments.